Some things can be appreciated even if they are not necessarily enjoyed. 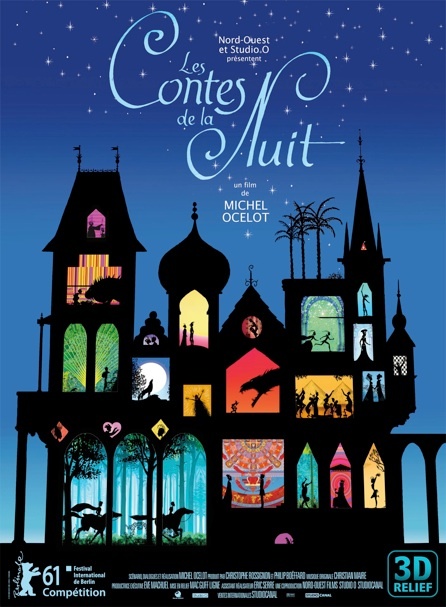 TALES OF THE NIGHT, the French 3D animated anthology film, is such a thing. The film collects six tales and legends from around the world. The stories all have a sort of primal appeal as such stories tend to do, and often conclude with clever twists or morals. The total package is held together both by a recurring motif of princesses and heroes in conflict with villains and monsters, and by a framing sequence in which an older man tries to convince two young actors to perform each story. 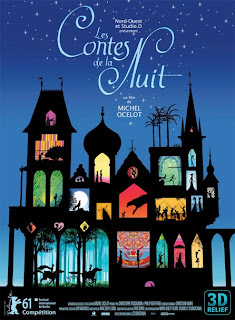 Visually the film is quite arresting, using a computerized version of the ancient “shadow puppet” style of storytelling. As with any animated film these days that doesn't have that same generic Pixar-lite look, the effort to do something different is more than welcome. However, while the film is somewhat engaging on an aesthetic and intellectual level, it never really engages the viewer on an emotional level, coming off as sterile and distant. Certainly the framing sequence, which ensures that we're always at at least one remove from the action, doesn't help in that respect. Five of the six segments here were originally shown on their own as part of a 2010 French television series called Dragons et Princesses (Dragons and Princesses). In that format the individual stories may well have been more effective. Certainly none are without at least some appeal, but seeing them one after the other and in the context of the framing sequence, the concept wears out its welcome fairly quickly. Whatever magic there is inherent in tales and legends of this sort, as presented here it's not enough to maintain the spell. 2 1/2 out of 4 stars.